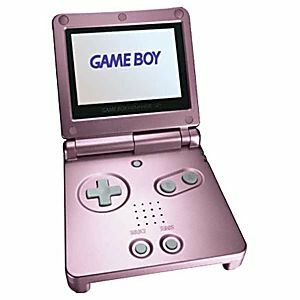 The later generation Game Boy Advance SP provides a brighter screen while still allowing you to play all of your favorite Game Boy, Game Boy Color, and Game Boy Advance games on one system! Game Boy arrived in excellent condition. Screen looks great, no scratches or dead pixels. Looked almost brand new, to be honest. This model's stronger back light setting is actually a tad bit too bright for my eyes, but the regular setting is perfect (it's actually brighter than my old 001 model). Overall, the system works like a dream and I'm very happy with it, been playing it a bunch this last week! Acabo de recibir mi SP la que puede con todo y me encanta el aspecto y la sensación, como nueva!, esta consola es de la mejores, con su gran catálogo de juegos recordando mi niñez y retro iluminada mejor…. Estos chicos son geniales! Gracias Lukie games. The Gameboy was delivered before Christmas. It had no blemishes on it at all, like new. Works great with the backlight. Lukie Games is an excellent vendor. Definitely will buy again from them! I just received my SP today and I love the look and feel of it and it plays like brand new! It came in a timely fashion as always, and they never cease to disappoint me on any products I've purchased from them. These guys are great! This console works perfectly! I would never have guessed it's 10 years old! I'm really happy with my purchase would 100% come here again if I am ever looking for any other second hand gaming goods. Just arrived today and I am so happy with this purchase! I read some not so glowing reviews on some other sites which made me a little hesitant to buy such an expensive item but boy am i glad i did,Game boy works great and is superb for the price. I do recommend buying one. Awesome purchase!! It looked brand new when I opened the package. Works perfectly! Awesome bright screen. Love using this item! Amazing purchase. Great replacement for an older broken handheld i had. I just bought one from LG, and I'm quite happy! I haven't owned a handheld NES system since my red Gameboy. So glad that this allows me to play GB, GB Color and Advance games!